A few years ago, Bob Bell and John Thielen, who have been friends since the early 1990’s, learned from an acquaintance that thousands of kids from low-income families in Denver go hungry each weekend. These families are often living in substandard housing on less than $30,000 in annual income for a family of four, and many guardians are unwilling or unable to adequately care for their kids. 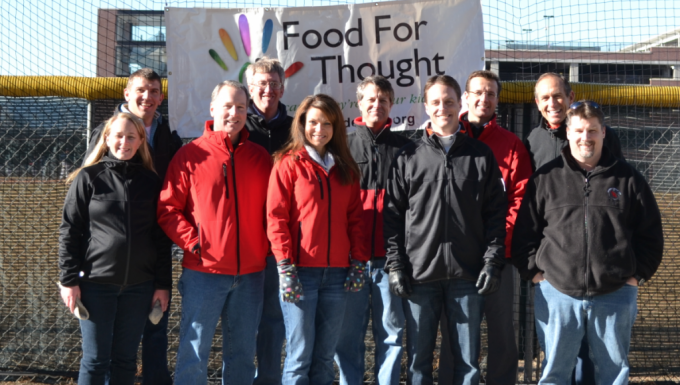 Bob and John were so shocked to learn that tens of thousands of elementary school students in their area don’t have enough to eat, so in 2012 they founded the all-volunteer nonprofit Food for Thought Denver to provide weekend meals for low-income kids. Each week, Food for Thought Denver delivers food to elementary school students to help get them through the weekend, impacting more than 5,000 people with every delivery. To date, they’ve provided over 300,000 lbs of food and almost half a million meals, and the teachers report back that the kids they serve are happier, healthier, and better able to focus in school.